Bug Martini » Bug Martini is Six Years Old! Bug Martini is Six Years Old! Holy crap! This totally snuck up on me. My old roommate sent me a text to congratulate me on the six year anniversary of my webcomic. I’ve been so busy with assembling the book that I just plumb forgot. 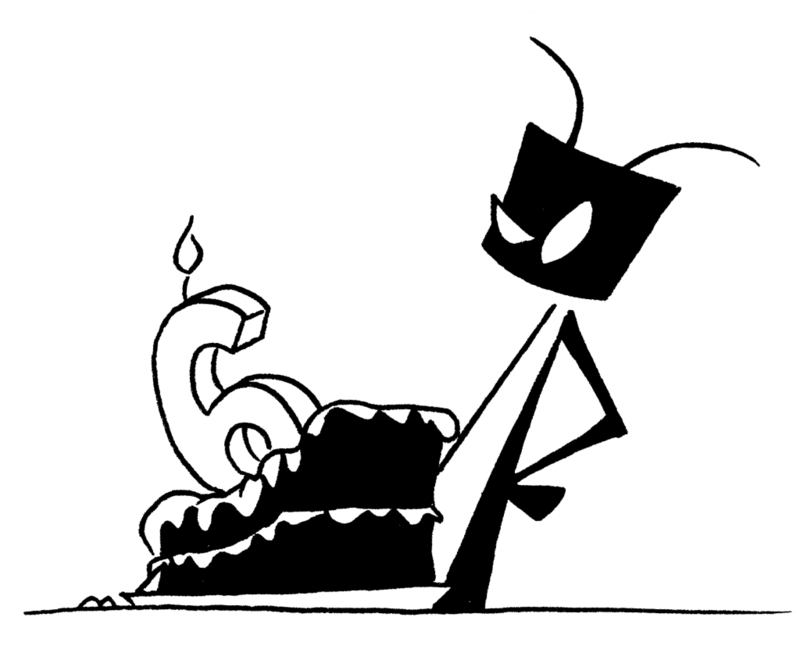 Thank you all so much for reading Bug Martini! It means the world to me that you have given my comic strip an audience of awesome people. I love reading every one of your comments and you guys and gals make this strip worth drawing. I hope to have the PDF of my first book collection of Bug Martini strips completed and off to the printer by the end of the month. I’ll keep you all posted on my progress. Thanks again to each and every one of you! You’re welcome. Keep it up, you can’t stop now. If you do, I’ll cut off that sweet sweet $2/month Patreon money and then where will you be? Is your book the best of past comics or new material that will never make it into the website? It’s gonna be the first year of strips along with some bonus sketches. Congrats! It’s been a lot of fun reading your work! Your strip is amazing. I look forward to reading it when ever I can and often laugh out loud. Keep up the great work!!!! Happy Boifdai BugComic! (BugMartini, BugCaipirinha and whatever else you’ll be in the future)! Love the B’day drawing… thanks for all the smiles you bring to us all! Can’t think of any other strip that made me go back and read all of them from the start, and certainly none other makes me look forward to Monday because there’s a new strip. Thanks, Adam, and long may Bug wave! By far the most addictive comic out there. Happy 1568th episode and here’s wishing you many more solar orbits! Wow! Your comic must be going of to kindergarten, then! Hey man, been reading for years, congrats on the success. Congratulations! You have much to be proud of. Can’t wait for the book! Thanks! I can’t wait for the book too!